We have had one of those days today where we have been really busy and got loads done, without it seeming like we’ve done anything! This morning Gordon and I counted all the tokens we’ve been collecting from newspapers and got them ready for sending off with forms for both Ladybird books and Lego. (I can’t wait to get our stash of goodies back!) Once counted, checked and double checked we headed off into town to post them and nip into WHSmiths to see if they had a copy of a Dr Seuss book I suddenly decided I needed a couple of days ago! As you may know, 2nd March would have been Dr Seuss’ birthday. Both Gordon and I are huge fans of his so we are both keen to get our kids interested as well. We already have a small set of his books and I have recently been reading Hop on Pop with Thomas, as a good “Beginner Reader” book for him. But it got me thinking about my favourite Dr Seuss book, “One fish, two fish, red fish, blue fish” and I made it my mission for this week to find a copy and buy it as I knew Thomas and Jasmine would absolutely love it as well. Now, with World Book Day this week, and Dr Seuss’ birthday only a few days ago I thought it would be simple to find a copy but I was wrong! My usual book shops (online) didn’t have a copy in stock so we had to go book shopping in town. I know I have made this sound like a bad thing so don’t get me wrong, I LOVE book shops. My bank balance however, and possibly my husband, disagree! I can never, ever, leave a book shop without several books I did not intend to buy! And that is precisely what happened today. We went in for one Dr Seuss book and came out with 2 Lego City storybooks (with Lego minifigures), 1 Lego Ninjago Activity book, Zog by Julia Donaldson (the only JD book in the shop that we didn’t already own! ), Lego Star Wars: The Phantom Menace storybook, and finally after searching the shelves and having to ask a member of staff where we might find it, Dr Seuss’ One fish, two fish, red fish, blue fish! After the book shop and some lunch we tried to finish our shopping but got slightly distracted by a new toy shop that has recently opened. In we went, again not intending to buy much! Ha! After a few minutes of begging, we relented and told the kids that anything they wanted to buy would come from their pocket money. So out we went with some new Lego, some Top Trumps and the obligatory cuddly toy for Jasmine! One last shop to go in. The craft shop.. (see previous paragraph about buying things I don’t intend to in a book shop and replace “book” with “craft”!). I needed double sided tape. I bought double sided tape, plastic sewing needles for the kids, a bag of buttons (they looked nice??!?) and a totally random piece of craft foam that Jasmine insisted she “needed for modelling”! Finally, we went home to read our newly purchased books and build our newly purchased Lego. I’d love to be able to post a photo here but I’m afraid I was too busy reading and building to remember to take a picture! 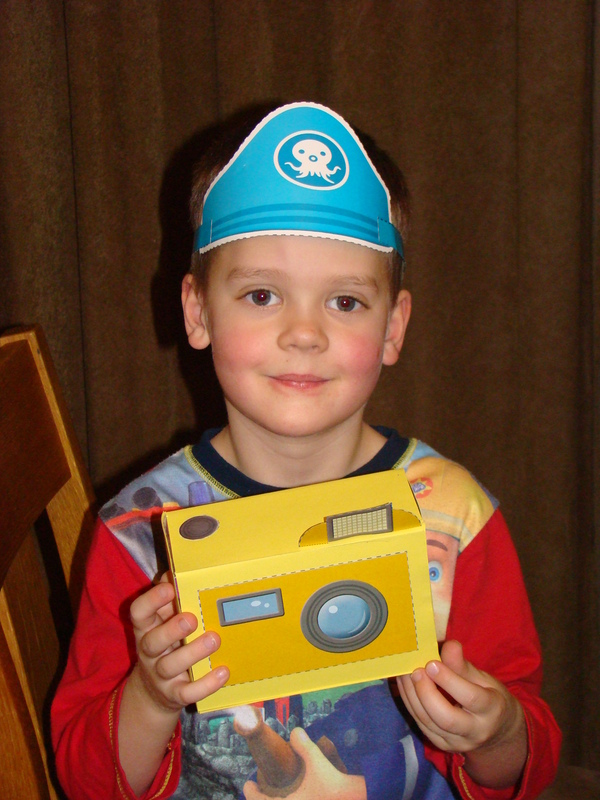 The last task of the day was to finish making the Octonauts camera from a box, some yellow paper and the last page of the most recent Octonauts magazine. Thomas has been asking me to help him with this since last Friday so it was time to get it done. He was extremely happy with the results! Tomorrow we are staying away from shops and will be doing stuff with Lego, buttons and craft foam!